Moolah Shrine Center, 12545 Fee Fee Rd. 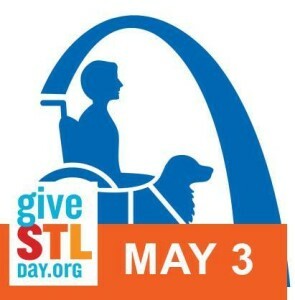 Give STL Day – Support Dogs, Inc.
We want to show off our brand new building! Join us for tours, meet the staff and see the dogs in our new location. An official ribbon cutting ceremony will be held at 5:30. We can't wait to see you there! 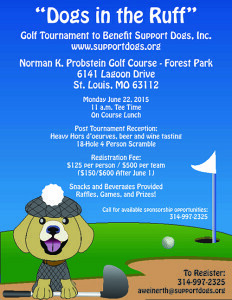 Please contact Peggy at pmusen@duodogs.org or call 314-997-2325 with any questions. RSVP for the event here. Chase Park Plaza, 212 Kingshighway Blvd. 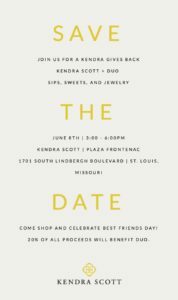 Kendra Scott at Plaza Frontenac, 1701 South LIndbergh Blvd. Event extended to Friday, June 8. Get your donation in now! Artist Elle Halle has generously offered a special fundraiser for Duo. With a donation of at least $15, Elle will create a digital watercolor of your best friends. Make your donation, choose from the Traditional style, the Oil style or the Sketch style, and upload your photo. 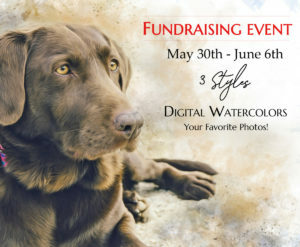 Within a couple of weeks, Lin will send you a digital watercolor artwork that you can print, frame and cherish forever! Please join us on Friday, August 3 to celebrate the graduation of Tucker, Sky, Toby, Bud, Avery, Shandy, Stella, and Amber from Team Training. 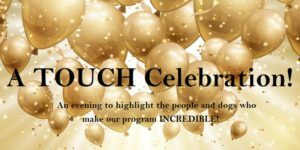 You are invited to attend a special meet and greet where attendees will be able to meet the clients that will graduate alongside the puppies specially raised by Duo and our great volunteers. Meet and greet begins at 5:15 pm; graduation begins at 6 pm. Please join us as we celebrate the graduation of Patch, Levi, Liberty, Sara, Teddy, Simba, and Kenai from Facility Team Training. 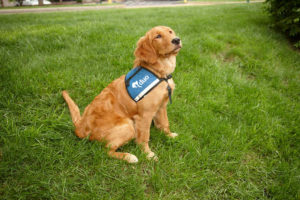 Attendees will enjoy a special meet and greet where they’ll be able to meet the facility that will be graduating with the puppy our dedicated volunteers helped the dogs get off to a great start in life. Meet and greet begins at 5:15 pm; graduation ceremony is from 6-8 pm. 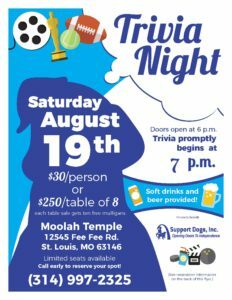 Save the date for Duo Dogs Trivia Night on Saturday, August 18th at the Moolah Shrine Temple. Tickets go on sale on June 1st. 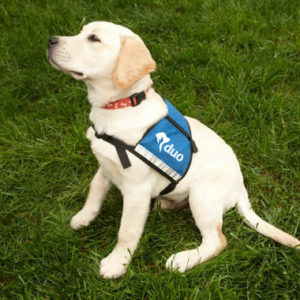 Proceeds from the night goes to support Duo Dogs and all that they do. 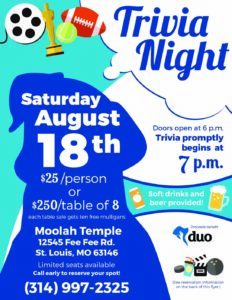 Time Doors open at 6pm and Trivia begins at 7pm. Cost Tickets are $25 per individual or $250 for a table of eight, which includes 10 mulligans. Copyright © 2019 - All content owned by Duo. Sitemap. Privacy Policies. Terms of Service. Website Feedback.